This week’s photo is brought to you by the idea of overcoming the addiction of sleeping in to engage in healthy and productive activities. 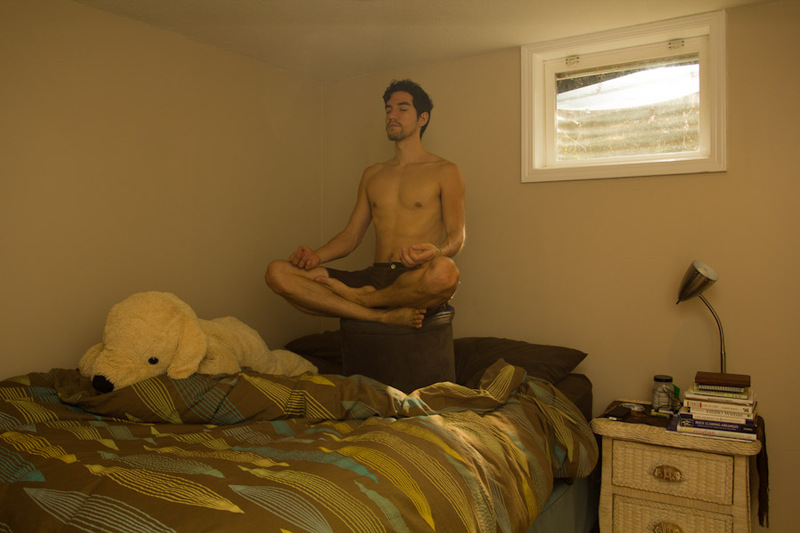 …let me just say that I’m still not very good at waking up early, but I am being better about doing yoga, meditation, and/or exercise everyday. 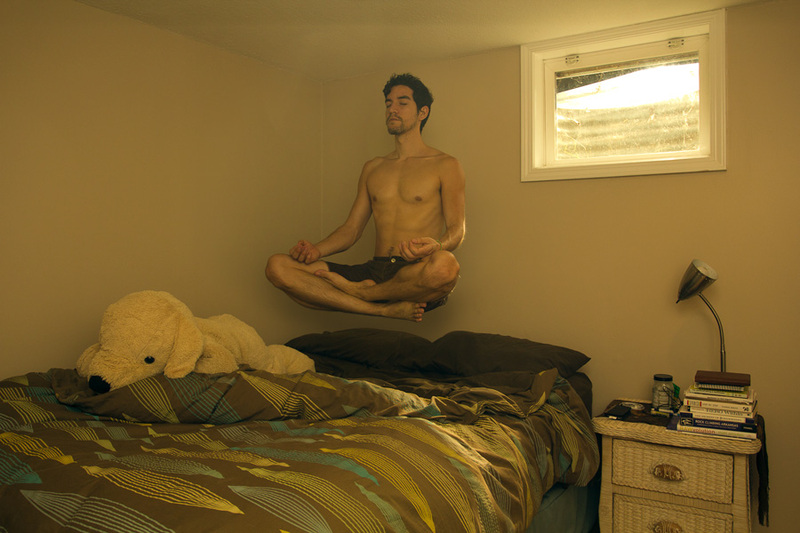 Anyways, this photo represents what I wish would happen when I first wake up – levitation through meditation. For some reason, getting out of bed is always the longest process for me… It’s just so dang comfy! But the idea is to rise above that comfort to pursue living a balanced and healthy life every day. At first, I was planning to do a levitation-type photo where I was laying down flat and floating upwards with a sheet over me, but then it just started looking like something out of Paranormal Activity, so I scrapped that idea. One thing I’m learning from this Project is that I’m not very good about planning, or maybe just sticking to the plan or original idea. Part of that may be that I don’t plan enough details ahead of time, and part of that may be that plans change and that it’s good to play around with an idea until you have something that you like. What you may not have realized is that it was actually around midnight when I got inspired to create this photo, and when it hits I run with it. So to recreate a morning sunrise, I put a flash with a CTO (Color Temperature Orange) gel outside of my bedroom window so that it would give light to the window area. What was really nice is that a streak came through the window and hit my arm and bed, which added to the realism. And what was super funny is that Lucy probably thought something crazy was going on outside of her bedroom (her room is directly above my room, and that flash was probably leaking into her window as well). 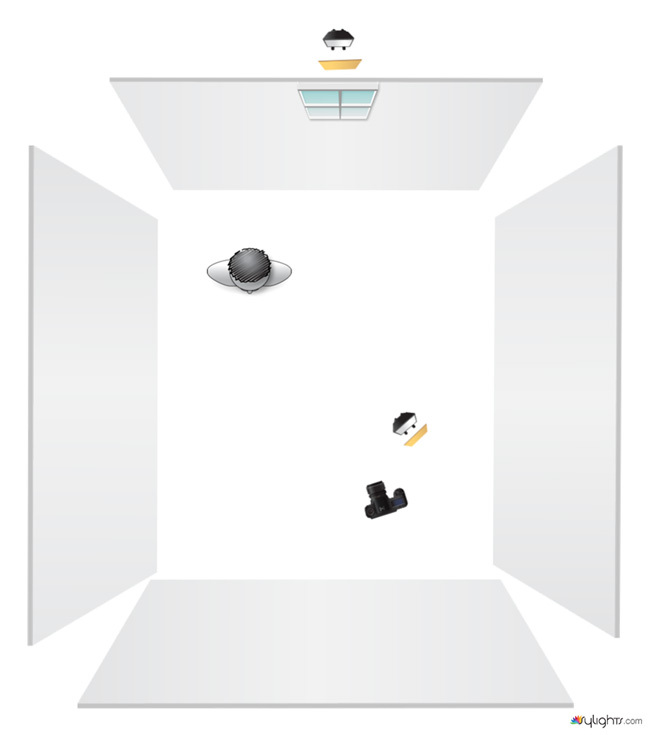 Another thing I’ve been learning is how to light the interiors of rooms, and from that I decided to use a simple technique to create a large light source – aim a flash into the top corner of a room. Assuming that your walls and ceiling are white, you’ve just created a 3-8 foot umbrella/softbox/reflector. After adding a CTO gel to that flash as well, it matched the outside flash’s color temperature, and made midnight look like 7am. It wasn’t really magic, just photoshop. I was sitting on a footrest to elevate me to about the height I wanted to be. I also took a second photo of just the room so I could simply photoshop the footrest out, draw back some of my leg and foot, and draw in some more of the shadows behind me. I also took some time to play with the color temperature with a Curves adjustment layer, sharpened the photo, and viola!! !Bravo Rob¡ no te había conocido en tercera dimensión, pero veo que lo estás haciendo bien.ojala puedas lograr el equilibrio perfecto:cuerpo,alma,espíritu y tu entorno natural. Recuerda que lo mejor es lo que está adentro del ser humano.